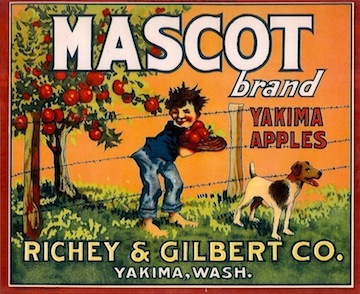 Our Yakima Valley roots go back to 1897 with the Richey & Gilbert Company. H.M. & Marion (Richey) Gilbert came to the Yakima Valley in Washington State from Geneseo, Illinois. In the early days the largest Richey & Gilbert plantings were row crops in the Lower Yakima Valley. The enterprise included a bank and a hardware store in Toppenish. Marion headed up the homeplace along with their children, while H.M.commuted by train each week to Toppenish. Many family members from Illinois and New York helped the business survive during the Great Depression. Sons Curtiss and Elon Gilbert worked together in the business for a number of years. Upon Curtiss' death in 1947 various family members pitched in, including Curtiss' wife, Anne (Seeley), daughter Carol Anne Gilbert (de La Chapelle) and sons Mark & his wife Betty (Catlin) Gilbert, Bruce and Cragg. Eventually Cragg D. became general manager of what became known as Gilbert Orchards until his retirement in 1985. Each of Cragg D. & Virginia's children (Curt, Cragg, Purna & Janie) have played a role in the business. Their oldest son, Curt took the lead following Cragg D.'s retirement until the end of 2012, when his younger brother, Cragg M. Gilbert became general manager.